Black Swamp Conservancy is the land trust focused on land conservation in northwest Ohio. 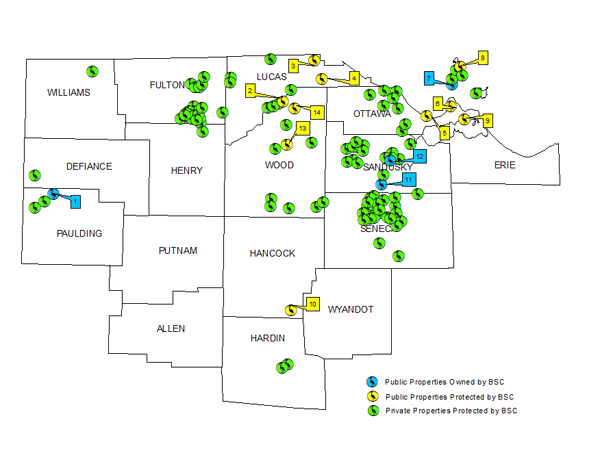 This map shows the counties in which we work and the location of many of the properties that comprise the over 17,000 acres that have been permanently protected by the Conservancy since our founding in 1993. While much of the land we protect is privately owned, some of our properties are open to the public. Listed below are properties protected with a perpetual land conservation agreement held by our Conservancy that are open to public access. 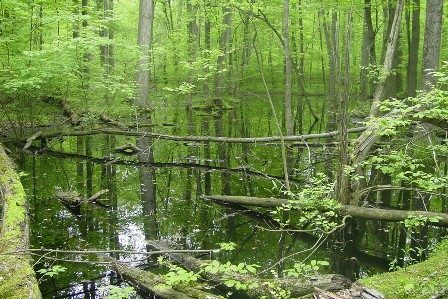 At 346 acres, Forrest Woods Nature Preserve is Black Swamp Conservancy's largest owned nature preserve. 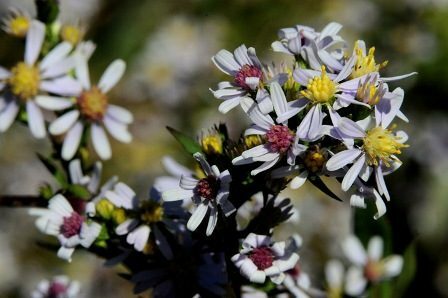 This site, which is one of the finest remnants of the historic Great Black Swamp, is home to more than 30 rare, threatened and endangered species of plants and animals. The property is open to the public by permit only. Contact Melanie Coulter for permission. Information on our current restoration project can be found here. 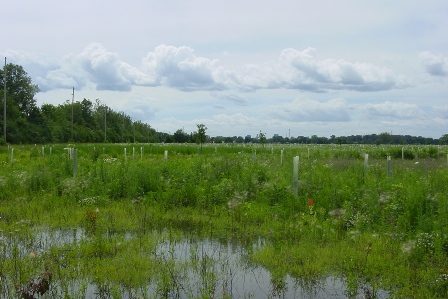 Purchased in 2013, more than 16,000 trees have been planted on this riverside preserve. This is one of the Conservancy's projects aimed at improving water quality and expanding wildlife habitat.. In time, the preserve will be opened to limited public access for hiking, picnicking and fishing. A new Black Swamp Conservancy project just outside of Fremont on the Sandusky River. Check back soon for more details. 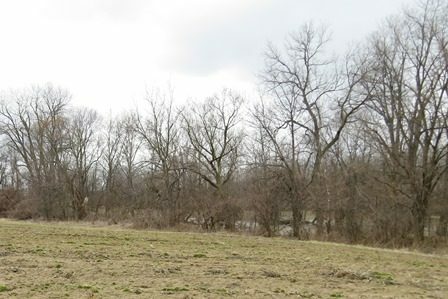 With the Sandusky River as a centerpiece, this coming park will feature prairie habitat, woods, wetlands and river access near the city of Fremont. 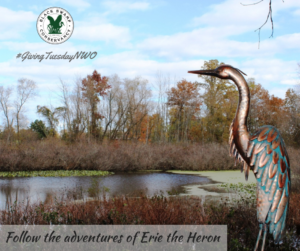 This site was acquired in 2017 by the Conservancy, and subsequently gifted to Sandusky County Park District. The Conservancy and Park District are now working to restore natural habitats and develop visitor facilities. This 12.9-acre property is located in Perrysburg's historic district and owned by The 577 Foundation. The site and foundation were established by Virginia Secor Stranahan, a founder of the Black Swamp Conservancy. 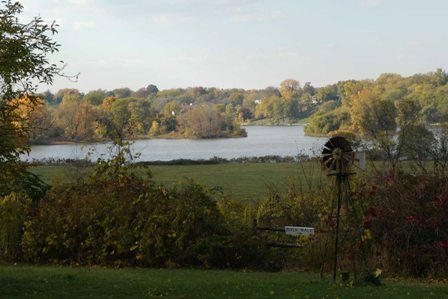 The property hosts a Maumee River walk, community gardens, and many other outdoor and art activities for the community. Black Swamp Conservancy holds a land conservation agreement on the site, protecting the property in perpetuity. Click here to visit the 577 Foundation website. The South Shore Park wetlands are part of a 17.8-acre wetland and stream restoration site owned and managed by the City of Oregon. 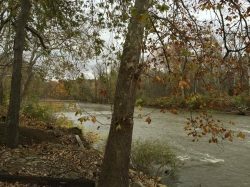 Black Swamp Conservancy holds a land conservation agreement on the site, protecting it in perpetuity. 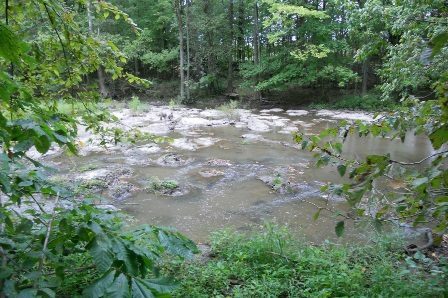 This project involved the restoration of nearly 2 miles of stream channel and of more than 2.2 acres of wetlands at the outflow of Lake Erie. 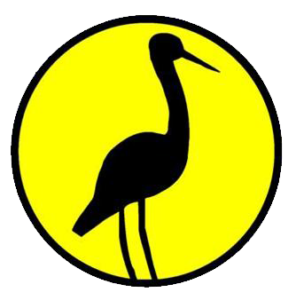 For more information on South Shore Park Wetlands, click here. 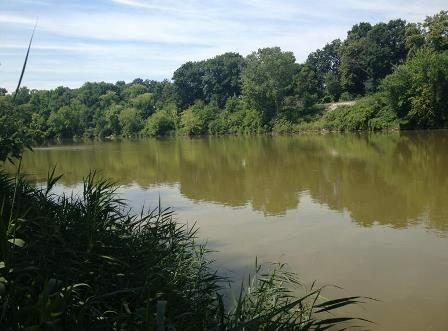 Pearson Wetlands is a 248-acre wetland mitigation bank owned by Toledo Metroparks. 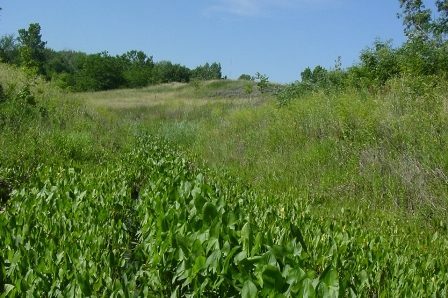 This property, which was farmland as recently as 2006, has undergone extensive restoration work including: hydrological restoration, stream restoration, and planting of more than 27,000 trees. Black Swamp Conservancy holds a land conservation agreement protecting the site in perpetuity. 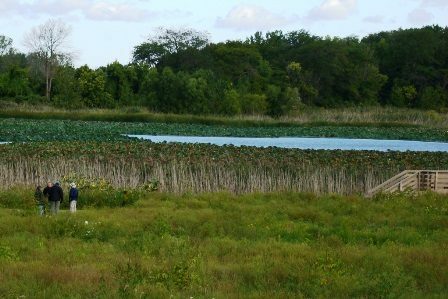 Ohio Wetlands Foundation is responsible for the wetland mitigation banking. 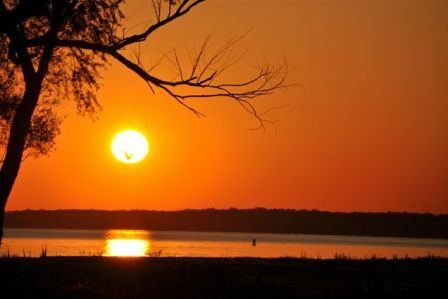 The Lakefront Preserve is a 14.7-acre property owned and managed by the City of Port Clinton. Black Swamp Conservancy helped to facilitate the purchase of the preserve and holds a land conservation agreement protecting the site in perpetuity. The Trust for Public Land was also an important partner, helping to secure funding for the project. The site is a popular fishing and resting area for bald eagles. Cedar Meadow Preserve is a 63-acre property owned and managed by the Catawba Island Township. Black Swamp Conservancy helped to facilitate the purchase of the preserve and holds a conservation easement protecting the site in perpetuity. The preserve, which contains a mix of mature forest, wetlands, and grassland/shrubland, is an important stopover site for migratory birds. 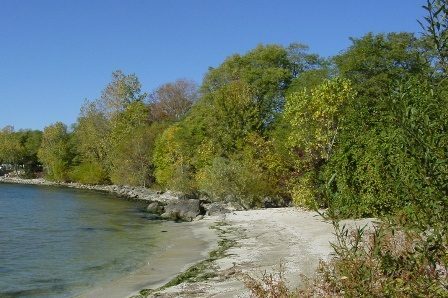 The Middle Bass Island East Point Preserve is a 7.8-acre property owned and managed by the Put-In-Bay Township Park District. Black Swamp Conservancy helped to facilitate the purchase of the preserve and holds a land conservation agreement protecting the site in perpetuity. 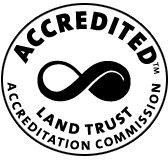 The Trust for Public Land was also an important partner, helping to secure funding for the project. This property features 700 ft. of Lake Erie shoreline, mature forest, and grasslands. This important migratory stopover site is Ohio's first kayak-only preserve, accessible from a dock on the shore. 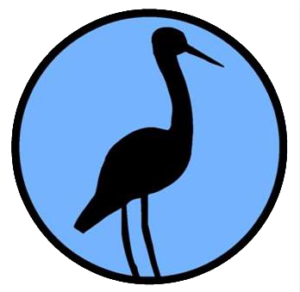 Owned and managed by Danbury Township in Ottawa County, the 190-acre Meadowbrook Marsh Preserve includes trails, picnic areas and an observation platform for wildlife viewing. The property contains a diverse mixture of habitats, and harbors a number of rare and threatened species. Owned by the Hancock County Park District and nestled in the southeast corner of Hancock County along both sides of the Blanchard River is Hershey Riparian Woods. Home to six rare species (including two which are federally endangered), the property contains a mile and a half of natural river corridor. This Wood County Park District Property has been developed into a depression-era living history site. Life and farming in the 1930s are recreated through interactive programming utilizing the original homestead and barns. Along with 60 acres of farm ground, there is also a 10 acre woodlot on the property. 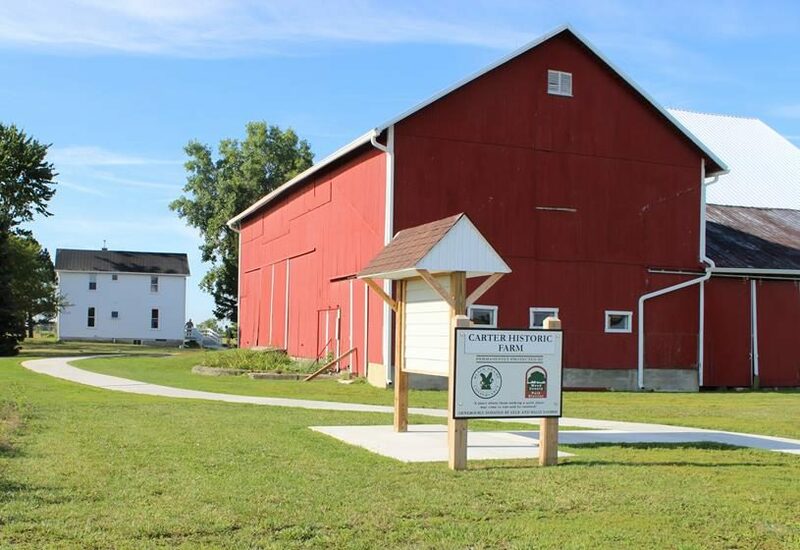 More information about the farm can be found on the Park District’s website by clicking here. 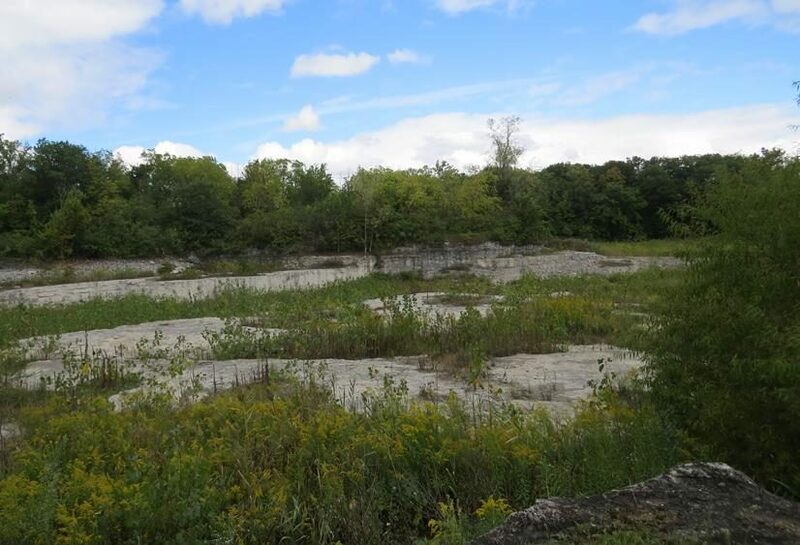 Owned by the Wood County Park District, the Sawyer Quarry Nature Preserve is home to 60 acres of woods along with a limestone quarry and homestead. The Preserve is currently open for limited public use which includes programs such as rope rappelling, seed cleanings, and campouts. To find out about upcoming programs, click here.